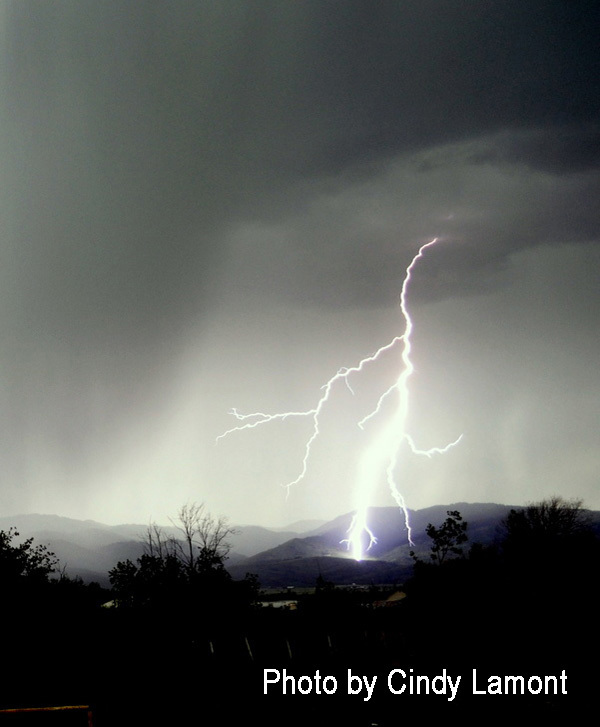 During the summer months in the mountains, lightning is probably the greatest weather hazard we face when recreating. You don’t have to be climbing the Grand Teton (with a backpack full of metal objects, no less) to be struck. Even though the Grand is the absolute highest point around and your odds are considerably increased, it is also possible to be struck by lightning in the valley, on the baseball or soccer field, out on the lake or the golf course, as well. It has been an ongoing challenge of mine to educate as many people as possible on the subject of “Thunderstorms and Lightning Safety”, and I will outline at the end of this article the most important things to watch for when you are outdoors this summer. I have also been working on a project to install a Lightning Detection System for the local area. This has been a cooperative effort between MountainWeather and Snow King Mountain to provide an early warning of approaching thunderstorms, and their dangerous lightning. This project was originally conceived to help make the summer operations at Snow King a little safer. Although, you must keep in mind, this is a lightning detection system, not a lightning prediction system. It is only capable of plotting strikes that have already occurred. Just before the Fourth of July Weekend, Adam Shankland of Snow King, AJ Best of Gliffen Design (my IT guy), and myself installed the instrument at the top of Snow King. Since then we have been able to test, re-configure, and retest the system over the several days of thunderstorms that we have experienced over the course of the last few weeks. It seems now like it is working well enough that I am almost ready to put the lightning map on the website and make it available to the public on the mountainweather.com website (it will be under the Jackson Hole drop down menu). This instrument can detect lightning strikes out to a radial distance of approximately 200 miles, less in some directions and further in other directions. This variability is due to the complex mountainous terrain that surrounds us here in western Wyoming. Not only will this instrument detect dangerous ground strikes, but it will also detect in-cloud lightning bolts, which often are the first indication of lightning activity in thunderstorm clouds. All of this information gets plotted on a scaled map, with distant rings out to a radius of 300 miles. When this information gets linked on the mountainweather.com website I will make an announcement here on the MountainWeather Blog (and on Facebook). At that time I will let you know how to interpret the information, what its limitations are, and how to best utilize the map. There will also be an opportunity to receive e-mail warnings from this system (for a small monthly fee), so that you can receive fair warning when lightning is in the area, even if you can’t see it or hear it. That will be handy for those times when you are actually outdoors and not glued to the lightning map on the computer! While this project in no way assures that you or your property will be magically protected from lightning strikes, it does however provide you with another tool to perhaps increase your ability to avoid dangerous lightning. More on this project soon…. · The earlier in the day clouds start building; the earlier in the day thunderstorms can occur. · The more cumulus cloud there are covering the sky, the better the chances of developing larger and more dangerous thunderstorms. · The taller the cumulus clouds are, the more likely they will produce a thunderstorm. · The darker the base of the thunderstorm, the taller the thunderstorm is, and the more likely it is to produce a heavy downpour of rain and/or hail. Very dark bases over a very broad area indicate potentially more violent thunderstorms, with strong wind gusts or even tornadoes. · The “scattered sheep” or “fair weather” cumulus type clouds never develop vertically very much. Their bases stay white all day, rather than turning gray, and they do not pose a threat. · Prime time for thunderstorm development is mid-afternoon to early evening (2 p.m. to 7 p.m.). Nocturnal (nighttime) thunderstorms are usually the result of a storm system or a cold front passing. Or, they may be related to “monsoon” moisture coming up from the south, usually in July & August. Timing Lightning to Thunder: Lightning travels at the speed of light. Thunder travels at the speed of sound. Therefore, lightning is seen before the thunder is heard. You can time how far away the lightning is by counting, in seconds (one-thousand-one, one-thousand-two, etc. ), from the time you see the flash, until the time you hear the thunder. Take the number of seconds and divide by 5 to calculate the distance the lightning is from you in miles. Seconds Counted / 5 Seconds per mile = Number of Miles Away. 25 seconds = 5 miles away. 5 seconds = one mile away. 1 second = less than a quarter mile away. · Get away from metal objects, including fences, hardware or machinery, chairlifts, golf clubs, etc. · Never stand under a lone tree. Being in a grove of trees of similar height is a better option. · Get off the ridgetops, get out of open fields, get out of the water! Swimming or boating is also very dangerous during thunderstorms. · If you are on an exposed ridge: sit on an insulated pad or backpack. Be sure you are not in a natural water course, like a gully, these will conduct ground currents when bolts hit nearby. · Retreat to a building or car, lie down in a dry ditch, or try to lie as low as possible. Lightning has been known to strike the ground from over 5 miles away! The 20/20 Lightning Rule: If the time between the lightning flash and the thunder is 20 seconds or less, then the lightning bolt was less than 5 miles from your location. It is time to seek shelter IMMEDIATELY! After the last lightning bolt is seen, give it about 20 minutes until you return to any exposed area. Oh thanks for your very helpful and concerned advice. I really do need it.I with me team is going for hiking this time and we are carrying portable ones rather than quality cabled weather stations for our safety and safe steps.